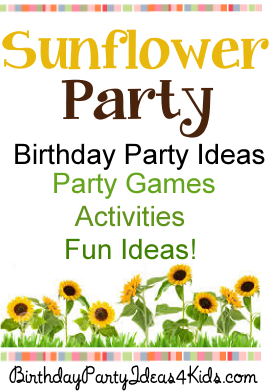 Just added to the Birthday Party Ideas for Kids website is a great new party theme for Fall – Sunflowers! We’ve collected all of our favorite party games and activities with a Sunflower theme that kids love. Easy ideas that are budget friendly and fun for kids ages 5, 6, 7, 8, 9, 10, 11, 12, 13, 14, 15, 16, 17 years old. Sunflower theme party games, Fall Scavenger Hunt with free item list, Activities and more! Birthday Party Ideas for Kids is the starting point to planning parties. Party games, birthday activities, sleepover and slumber party ideas and over 200 Birthday Party themes! Everything you need to plan the perfect birthday party!